We’re excited to tell you all you’ll want to know about the revolution in cochlear implant audio processors—RONDO 2. Our latest audio processor is the only one on the market that is wirelessly rechargeable. You can say goodbye to changing batteries as the RONDO 2 offers you up to 18 hours of hassle-free hearing! RONDO 2 is our brand new audio processor for MED-EL cochlear implants. 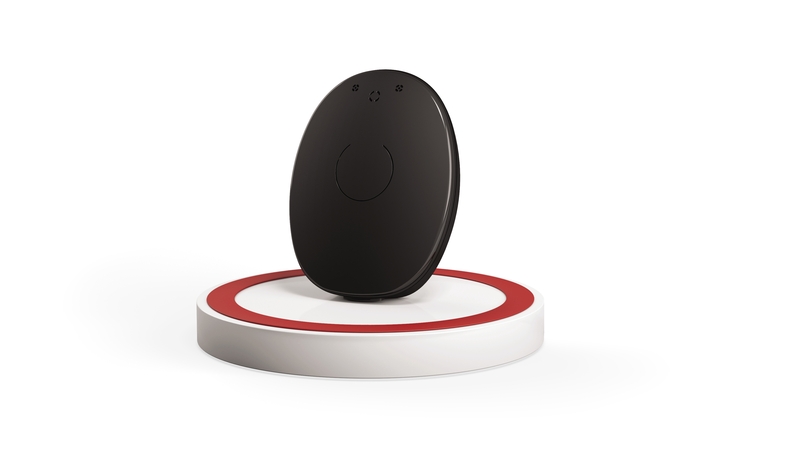 As a fully wirelessly rechargeable device, it is the very first of its kind in the world. RONDO 2 is a single-unit audio processor, which means that the coil, battery, and control unit are combined into one compact design that is worn comfortably off the ear. RONDO 2 is the second generation of our original RONDO released in 2013—which back then was also the first audio processor with a single-unit design. RONDO 2 is the first ever audio processor with a built-in rechargeable battery that can be charged wirelessly. This means the days of buying and changing batteries are gone! Just place the RONDO 2 on the charging pad at night and wake up to a fully charged RONDO 2—and a full day of hearing. Who can use RONDO 2? RONDO 2 is compatible with all MED-EL multi-channel cochlear implants from the past 25 years. Recipients with SYNCHRONY, CONCERTO, MED-EL CONCERT, SONATA, PULSAR, C40+, or C40 internal implants can use RONDO 2. How big is RONDO 2? RONDO 2 is incredibly small and compact, at just 46.8 mm long, by 35.8 mm wide, by 12.1 mm thick. It only weighs 14.9 grams, and is 17% lighter than the original RONDO. It has a small, compact, and streamlined design which can be totally hidden under hair. With its lightweight design completely off the ear, RONDO 2 is perfect for all-day wearing comfort. People who wear glasses will really love this design too. How do you charge RONDO 2 and how long does the battery last? RONDO 2 has an integrated lithium-ion battery inside that can be wirelessly recharged with a charging pad, without the need to change batteries! A 4 hour charge provides up to 18 hours of battery life—perfect for charging overnight. This long-lasting battery life is possible even while using high-performance settings or wireless accessories. 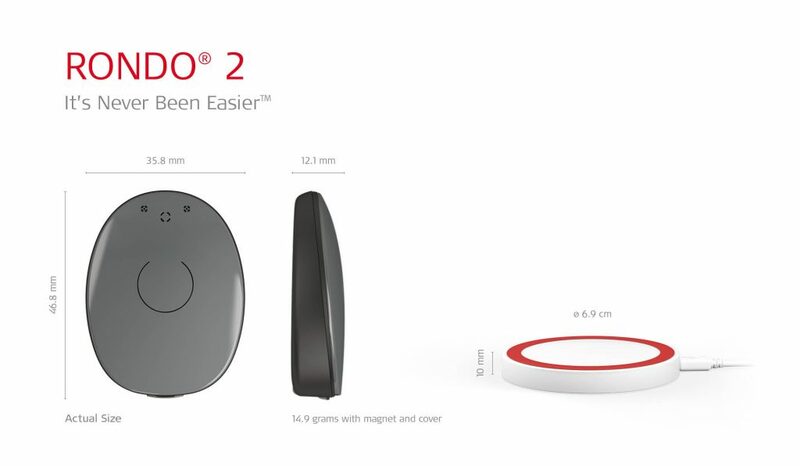 The wireless charging pad for RONDO 2 is powered by USB through a compatible wall adapter or computer. We know that sometimes things can get misplaced, even the charging pad. That’s why RONDO 2 is also available with a Mini Battery Pack that lets you power it with a regular AAA battery should you need a back-up option, which will offer approximately 35 hours more of listening time. What colors is RONDO 2 available in? Whether you want to make a statement, or make your processor invisible, the range of colors and Design Covers for RONDO 2 offers you some great styling options. Prepare to get excited! Firstly, the covers for RONDO are available in five neutral colors ranging from grey, to brown, to black, and these are each available in matte or glossy finish. Then, there are 24 Design Covers with hair patterns to help RONDO 2 blend in with any hair tones, including white, blonde, red, and jet black. For those who love to wear their processor loud and proud, you’ll have a tough time choosing your favorite from all of the other colorful and fun Design Covers—there are so many bold options available! You can roar with wild animal prints, play with cute pirate and princess cartoons, or go stylish with tartan and stained glass patterns. What wearing accessories does RONDO 2 come with? There are a range of attachment options for the RONDO 2 for additional fixation! They are: Clothes Attachment Clip, Hair Attachment Clip, GripWear, Activity Clip, Fixation Loop for Glasses, and the Sports Headband. How can I connect RONDO 2 to my smartphone, music player, television, etc.? RONDO 2 can seamlessly connect with Bluetooth neckloops and hearing induction loops to help you hear your best in noisy environments, like at family gatherings or in restaurants. The various ALD options can stream sound to your RONDO 2 from your smartphone, music player, television and more! 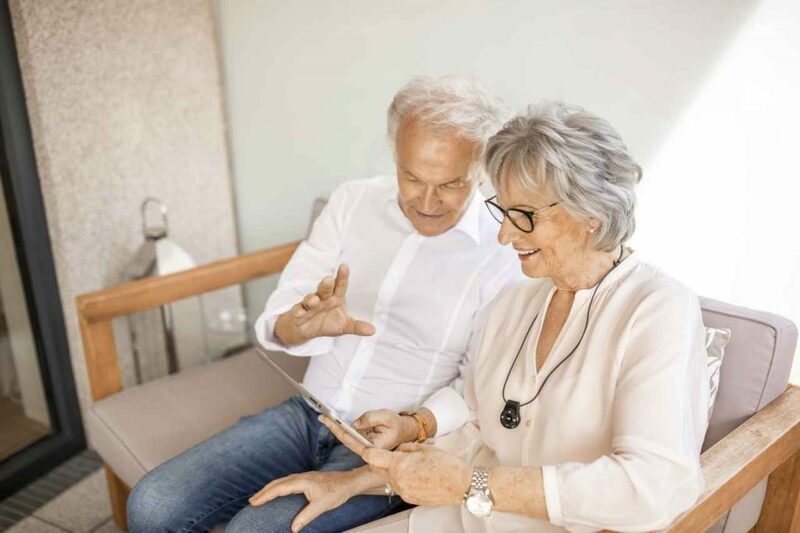 As these ALDs use Bluetooth and Telecoil technology, you don’t need to worry about always upgrading to the latest smartphone software or having a compatible phone. Bluetooth neckloops like the Quattro 4.0 or Artone 3 MAX work with any Bluetooth-enabled device, including iPhone, Android, and most other smarpthones. Another connection option is the Mini Battery Pack accessory. These various connectivity options enable RONDO 2 to be easily connected to almost any external audio device. Yes, RONDO 2 has a splash-proof design that’s protected against sweat and other moisture, so you don’t need to worry about getting caught out in the rain. With the WaterWear accessory for RONDO 2, you can swim all day in pools, lakes, oceans, and more, without the need to stop and change batteries! RONDO 2 is also dustproof & sweat resistant, making it very reliable and low maintenance. Additionally, a drying kit is not necessary for RONDO 2 due to its splash-proof design. How easy is it to change settings? RONDO 2 is the easiest-to-use audio processor ever made, so it’s the ideal option for anyone who wants to avoid fiddling around with lots of buttons or changing batteries. RONDO 2 has one simple on/off button. 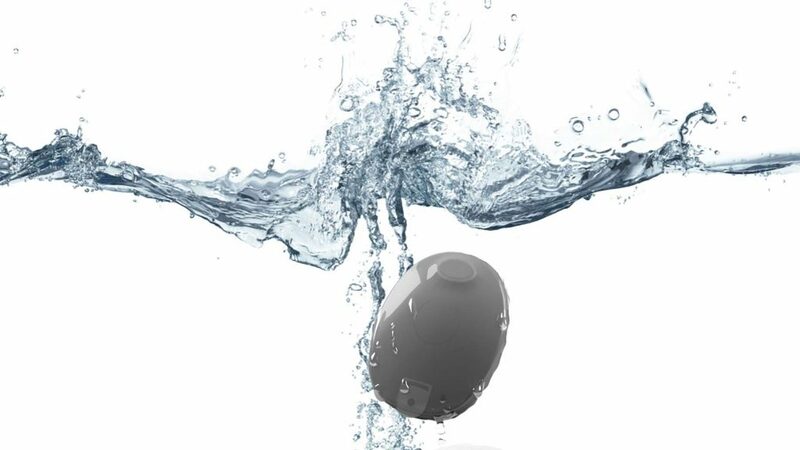 It has an omnidirectional microphone and is designed for hands-free control with Automatic Sound Management. minimizing the need to change settings with your remote. These simple handling features can be particularly beneficial for children, or those with limited vision or hand mobility. If you want to change settings however, you can use our simple FineTuner remote control to adapt to specific situations. How good is the sound quality of RONDO 2? RONDO 2 is powered by Triformance, our unique technology designed to provide you with the closest possible to natural hearing. To find out more about the specifics,, so you can read the specifics over on our Triformance technology post. Overall, it’s important to remember that the internal implant is the most important factor in sound quality of a cochlear implant system. 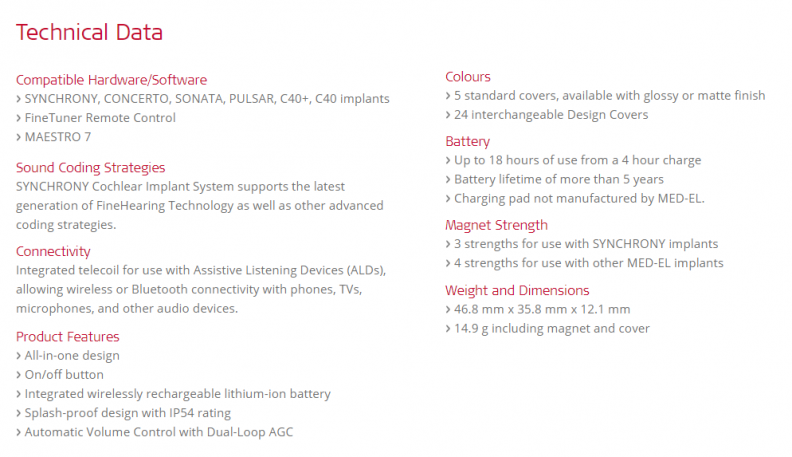 This is why we offer the widest range of flexible electrode arrays to offer the closest to natural hearing possible. There are no cables or disposable batteries to replace in RONDO 2, so the maintenance costs are very minimal. In fact, due to its cost-efficient design and technology, RONDO 2 is one of the most affordable cochlear implant audio processors available as it has almost no daily running costs! How do I order the RONDO 2, or find out more? Want to be the first to find out when RONDO 2 is available in your country? Sign up here to get all the latest updates! Have any other specific questions about RONDO 2? Leave a comment below and we’ll answer you directly!